If ever there was a good day for chili, today would be the day. It is grey, and gloomy, and rainy, and gross outside. It’s one of those days when you don’t want to leave the house, or get out of your pj’s, you just want to lay around all day and watch old movies. And eat chili. 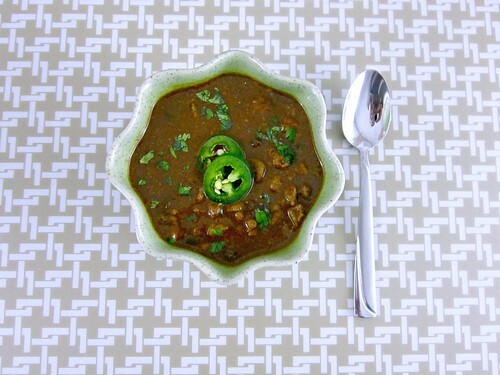 I love my traditional venison chili, but when I saw a recipe for green venison chili, I couldn’t pass it up. You know, verde sauce and all. Granted, I made quite a few changes from the original, but it worked for us and turned out mighty tasty! And it was simple to throw together, which is always a plus. This is definitely a good alternative to traditional chili, even if you opt to use beef or port instead of venison. 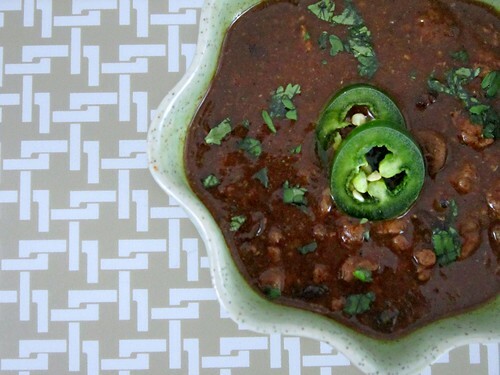 The rainy season is upon us, and chili is great for those gloomy weather days. This is a great variation to try out and add to your recipe box! Heat the oil in a large pot or dutch oven over medium heat and brown the meat, breaking it up with a spoon as it cooks. Add the salsa verde through salt and pepper, bring to a boil, then reduce heat and simmer for about 2 hours, to let the flavors really develop. Serve with cilantro and jalapeno slices for topping, if desired.